Photo by Josh Hughes Parkersburg’s Nathan Lindenmuth heads for home on a hit by teammate Kyle Moore during the Big Reds’ 6-3 win over John Marshall Monday. 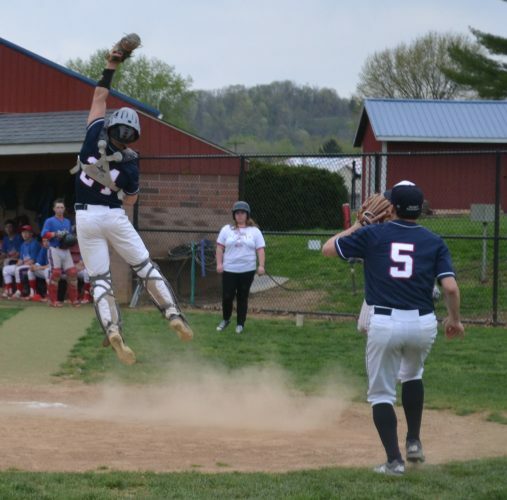 PARKERSBURG –T.J McIntosh’s control on the mound paired well with a big third inning for the offense, as the Parkersburg Big Reds took care of the John Marshall Monarchs, 6-3 Monday. The chilly temperature at Bennett Stump Field was quite the parallel for that hot pitching performance from McIntosh, who went 6 1/3 innings. PHS head coach Alan Burns praised his senior pitcher and noted his poise when he finally started to lose some command of his pitches. 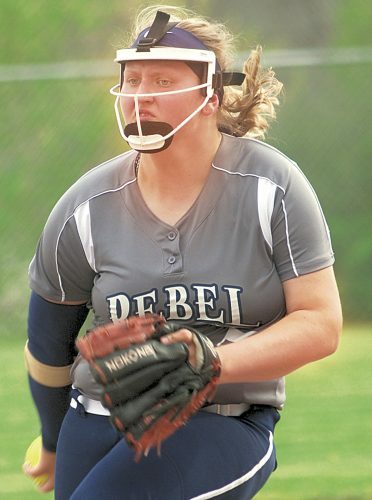 A moment that was not expected for the Monarchs was a third inning which saw the Big Reds bat around at a point where the game was still tied at one apiece. Jordan Batten laid off a 3-2 ball below his knees to reach first, and then the flood gates opened. Nolan Brace was hit by a pitch to get on in the inning. 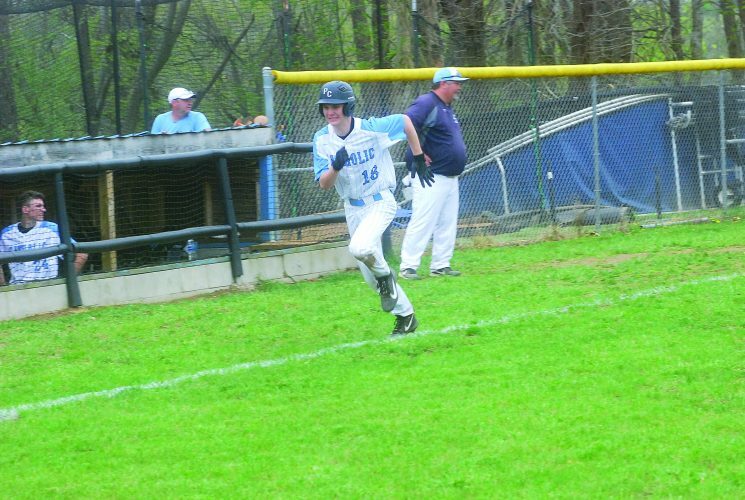 Nathan Lindenmuth watched a wild pitch sail past him to move the two runners up a base, and then he knocked an RBI single off Monarch pitcher Garrett Bratton. That run made it a 3-1 score, and Austin Curtis being hit during the following at-bat loaded the bases. Kyle Moore added to the damage done with an RBI single of his own that sent Lindenmuth home. 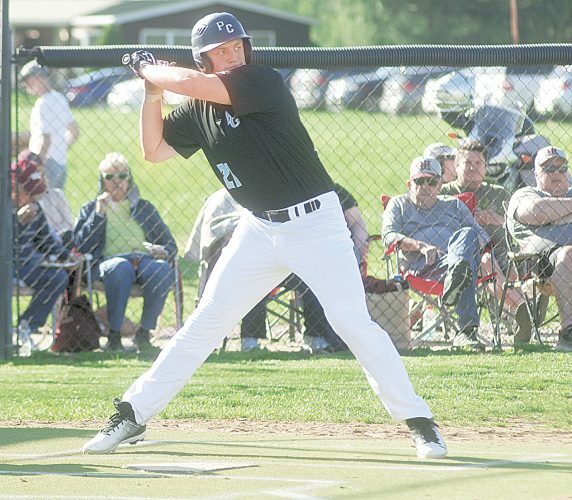 Connor Walker hit a fly ball into shallow-center that was just off the outstretched glove on the Monarchs centerfielder to bring home another run. 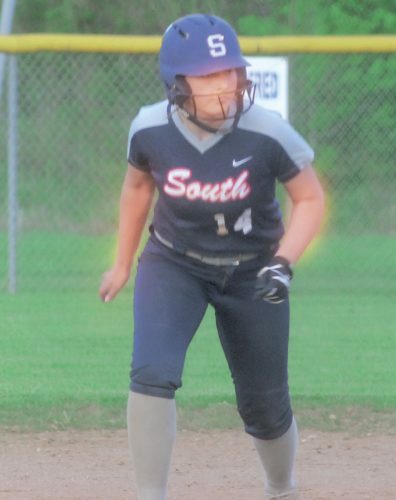 The final run of the frame scored via another wild pitch from Bratton, and all that scoring took place with no one gone in the frame After the struggling Bratton bounced back to retire the next three, it was too late for a John Marshall comeback. Still, Burns wanted more from his team. He felt they could have continued to add on the crooked number. What Burns referred to a final inning which saw John Marshall tack on a couple runs to put the game temporarily in doubt. Coming off six innings and 64 pitches thrown, McIntosh stepped to the mound for an opportunity at a complete game. After walking three of the first four batters he faced, Hayden Morris switched positions with McIntosh to record the final two outs. Morris found himself thrust into a tight game and surrendered a run off a wild pitch and a run off a fielder’s choice to record the second out. Brandon Gonchoff came to the plate with two men on and two away as the tying run, but didn’t deliver. 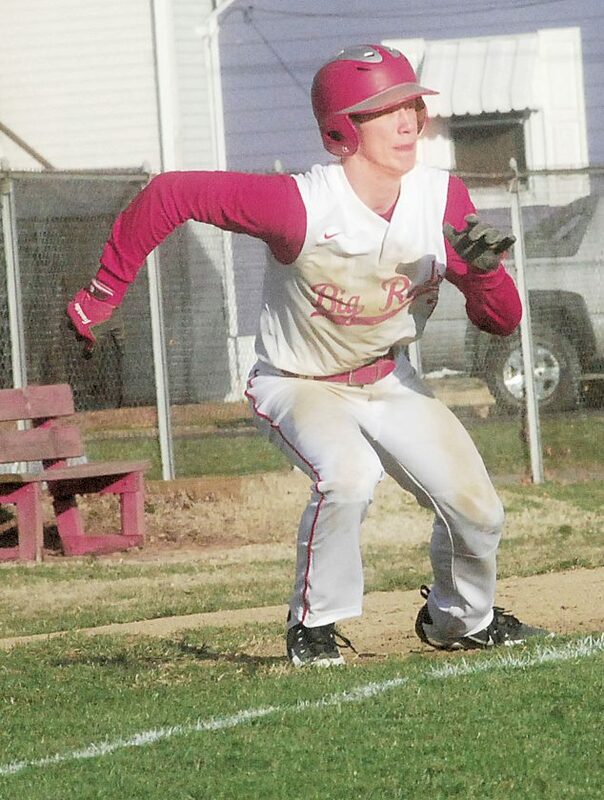 He flyed out to shallow-right to end the threat, as the Big Reds travel to Riverside at 4 p.m. The 3-1 PHS club goes into that game with hot bats and a good bit of momentum.